If you have passed through The Circle in recent days, you may have wondered why the ordinarily emerald green ground cover on the island that contains the fountain and some of the parking strips around the perimeter suddenly look like they’ve had a dusting of snow. The answer: The Kurapia planted there late last fall is flowering. 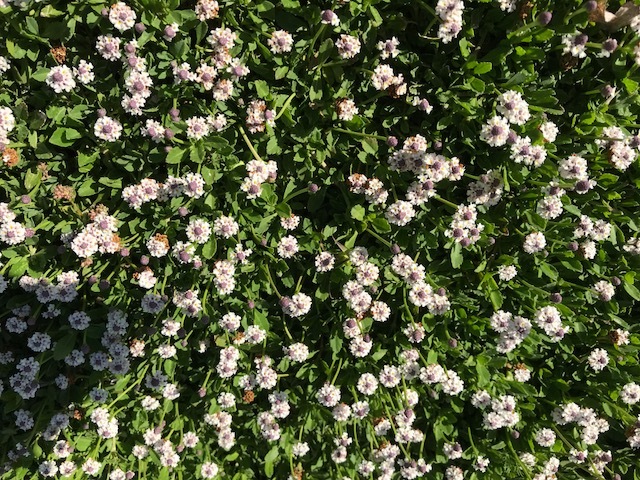 The low-growing ground cover resembles a healthy green lawn much of the year, but blooms in late spring and through the summer with thousands of tiny lavender-white flowers. Later this year those blooms will disappear, and the vibrant green will reassert itself. FOFW volunteers, meanwhile, are working with the city or keep all the new groundcovers in and around The Circle healthy by watering and weeding. We plan to be back out for a general maintenance work party the first Saturday of next month — that’s July 7 — and can always use more helping hands with those tasks, as well as raking, sweeping and more. You can just show up, or contact us if you are interested by clicking on our new “Join” button on our website’s home page. Sign up and we can keep you abreast of all things fountain and walk.